It’s February 28th, and a woman in a small rowboat glides past the Jefferson Memorial. A swan preens. It’s not too early for cherry blossoms, and just sunny enough for a wide-brimmed hat. It’s February 26th, and a woman in brightly colored yoga pants bends into downward dog. She flips her leg up, up, extending her toes to the sky. Her French bulldog attempts the same. It’s not reality – certainly can’t be. In late February, Washington’s cherry trees haven’t bloomed yet, at least not near the Tidal Basin. 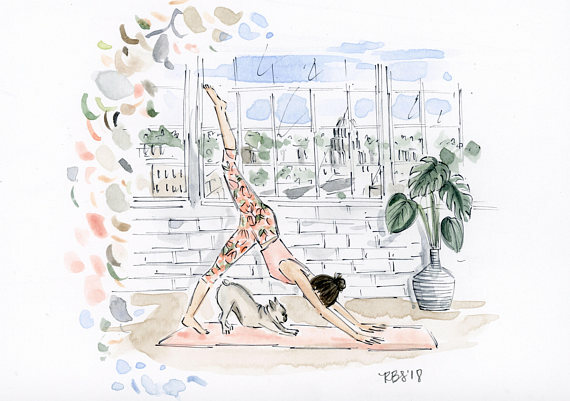 French bulldogs don’t do yoga, and if they do, they definitely can’t do it as well as this one can. These are watercolor vignettes painted by Riley Sheehey, 28, a local DC artist. Sheehey shares them in Instagram posts and stories, and sells them on her website, Make Things Co. Original pieces sell in minutes and for a few hundred dollars; prints sell less quickly, but provide Riley with enough business to make a comfortable living in Falls Church, Virginia. Sheehey wasn’t always this successful, and her pieces definitely haven’t always sold this fast. During the summer of 2014, Sheehey, a former elementary school art teacher, was looking for something fill her long and empty summer afternoons. She began painting personal projects. The first one? Mason jars. Sheehey removed them from the popular handmade e-commerce site and instead started making watercolor paintings, the ideas for which came from Instagram. The sketch was Sheehey’s gateway to commissioned illustrations: a friend from work spotted the piece on Facebook and asked her to paint a wedding portrait for them. Sheehey’s business truly took off in June 2016 when D.C.-magazine The Washingtonian reposted an illustration of Rose’s Luxury, a Capitol Hill mainstay. Sheehey was soon so busy that she was using her elementary school planning periods to finish commissioned pieces. This beginning wasn’t easy: she lacked free time and the equipment necessary to take her business full-time. (Sheehey frequented her local FedEx store, where she made scans and copies of her watercolor paintings.) Soon Sheehey’s commitment to her second job took a toll on her first, and she realized it was time to make a change. As most young adults do in times of trouble, Sheehey did the first thing she could think of: she called her parents. Sheehey has been her own boss since June 2017, and social media ­– which gave her her first client years ago ­­– continues to play a large role in how Sheehey shares and grows her business. Sheehey posts daily Instagram stories (photos and videos that remain online for 24 hours, visible to all of her followers) of sketches and watercolor illustrations. It’s there, on Instagram, that she notifies her clients when original pieces are posted online, and it’s there, on Instagram, that larger merchants like Sorel and CityCenterDC find her work and request to collaborate. Riley has worked with hair extension companies, preppy Americana-themed fashion designers, and The Washingtonian’s wedding magazine. Last January, Sheehey illustrated former First Lady Michelle Obama for American fashion designer Tracy Reese. “It’s been so exciting working with big brands, especially when they’re open to my ideas. They’ll tell me what their broad idea is, and then leave the creative direction up to me. They just say, ‘Do your thing.’ And that’s what I do,” Sheehey said. Finding personal artistic inspiration is tough, Sheehey said, when she’s always working for clients. And at the end of the day, work is still work… even when you work at home, or work for yourself.